There are so many things wrong with this post by Richard Posner that I hardly know where to start. Consequently, I’ll point out this XKCD comic and go from there. I’m very surprised that Mr. Posner seems to so completely misunderstand the web. Almost every web page in existence is copyrighted material, and every single web page in existence is provided to the viewer in response to a request made by following a link, either typed or clicked. No web page is served without the express permission of the website owner. There is nothing magical about a link that forces the website to provide the page simply because the link is followed and a request for the page is sent to the webserver. Websites can and do restrict access to web pages. What he is suggesting, in effect, is that copyright be extended to allow for the control over citation. Not just control over whether or not a particular page is provided in response to the request for that page, which is something that every website already has complete control over, but control over the ability to tell someone else that the page even exists. Ironically, he also suggests extending copyright to cover paraphrasing in a post filled with paraphrased facts and figures that were almost certainly obtained by reading some copyrighted source or another. And while he bemoans the lost profits suffered by the producers of copyrighted news, he neglects (and, in fact, encourages outlawing) the one thing that would allow the sites to obtain some ad revenue: a link to the original sources. Zinc Oxide-­Based Thin-­Film Transistor Experiments, Episode II is now available for your entertainment. Also, a static page with the current documents and some links to resources for making various types of semiconductors at home has been added. July 1st, 2009: “Zinc Oxide-­Based Thin-­Film Transistor Experiments, Episode II” has been updated to version 0.2. It will take me a while to write up a complete description of the experiment, but suffice it to say that I’ve managed to cobble together a working astable multivibrator using two homemade zinc tin oxide thin-film devices as the active components in the circuit. 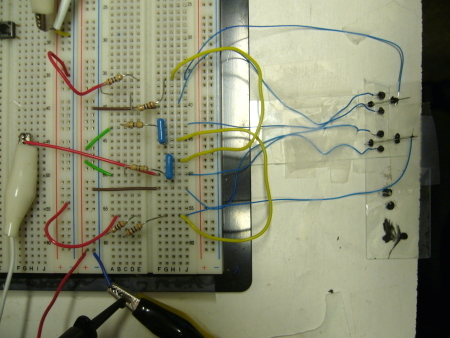 The circuit worked for about 16 hours before the liquid dielectric circuit failed. I’ve attempted to replace the liquid dielectric with fresh material, but doing so does not repair the device. At this point I really don’t know what caused the devices to fail. Above is the schematic of the circuit. Above is a picture of the circuit. The zinc tin oxide thin-film devices are on the right. Above is a graph showing the circuit’s operation over a majority of its lifetime. The data from the final hour of operation was lost when QtDMM crashed. The scale is too large to see the individual oscillations, but if you click on the image a much larger version is viewable where the individual oscillations are visible. Above is a zoomed in graph of the last hour’s worth of collected data. I’ll post more details soon. I have placed a “show and tell” document in the files section of the yahoo group home_transistor that describes the transistor thin film experiments that I’ve been working on of late. Since it is necessary to join the yahoo group in order to download the document from the group, I’ve attached a copy here as well. Google “homemade transistor” and you’ll find very little information concerning the actual making of a transistor from scratch. 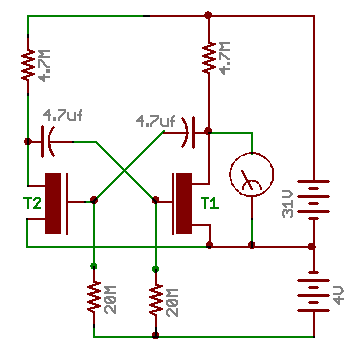 Making a point contact transistor is certainly doable, and there is some information available on the web on specifically how to approach the problem. However, start talking about any other kind of transistor and about all you’ll find is reasons why you cannot or should not attempt to do so. Mostly this is due to the complex equipment requirements (high vacuum, high temperatures) and extremely toxic chemicals used to make modern devices. Try googling “homemade semiconductor” instead and the first thing you find (April 12, 2008) is Nyle Steiner’s report on making negative resistance oscillators. His two sites, home.earthlink.net/~lenyr/ and www.sparkbangbuzz.com, are filling with interesting and reproducible experiments. As soon as I get or build a power supply capable of the 100 to 150 volts required, I plan on attempting to reproduce his flame triode experiment. At several points in the past I’ve looked at what was required to make a transistor from scratch, for reasons that can probably be summed up as “it is an interesting problem” and “it simply is not done, so it is a really interesting problem.” I’ve always stopped looking about the time I get to the part of the process that requires extremely toxic gases in a partial vacuum at high temperature. Recently, Jeri Ellsworth has reported developing a home chip lab consisting, essentially, of a tube furnace capable of reaching 1000°C, a source of nitrogen gas, and brushed-on doping solutions. Reportedly, an article for Make is being written, which I am really looking forward to reading. Lately, I’ve been researching and experimenting with a different approach to making semiconducting devices at home, one based on the production of semiconducting thin films deposited from liquid solutions. Chemical bath/solution deposition, liquid phase deposition via spin coating or dipping, and successive ionic layer adsorption and reaction (SILAR, which, in spite of its incredibly long name, is really just a matter of dipping a substrate into one solution followed by dipping it into another, repeating as necessary) all appear to be practical methods by which a workable semiconducting thin film can be made by the hobbyist. The Amateur Scientist column in the June 1970 edition of Scientific American discusses making a variety of thin films, and gives a recipe for making a cadmium sulfide-based thin film transistor using chemical bath disposition. Cadmium, however, is a relatively toxic material and notably bad for the environment. Zinc-based compounds, on the other hand, appear to have relatively low toxicities, and the production of zinc oxide, in particular, is very easy. Put a drop of an aqueous or alcoholic solution containing a zinc salt on a slide, heat it at 400°C for an hour, and the material remaining on the slide will be mostly zinc oxide. While the production of a good zinc oxide thin film involves a bit more chemistry and processing, it is not horribly complex nor does it require particularly expensive equipment. Zinc oxide fumes can cause “metal fever,” however, so adequate ventilation is mandatory. There is quite a bit of useful information concerning the making of zinc oxide based thin films and transistors that is hidden around the web. Bits and pieces of useful information can be found on-line in various open-access journals and papers. Some of the most useful information that I’ve found so far is found in a couple of theses and dissertations found on the ScholarsArchive at the Oregon State University. In particular, the dissertations of D. Hong and B. Norris, and theses of M. Grover and D. Heineck contain a wealth of practical information. I’ve purchased a copy of the book Transparent Conductive Zinc Oxide, Basics and Applications in Thin Film Solar Cells and it has a lot of good information about zinc oxide films in general, but its coverage of disposition methods is mostly limited to techniques such as sputtering, chemical vapor disposition and pulsed laser disposition. None of these methods is particularly practical for the casual hobbyist. The go-to book for sol-gel information appears to be the Handbook of Sol-gel Science and Technology: Sol-gel. However, at $1400 for a used copy it is pretty much unobtainable, save for the little bits that are viewable via Google Books. I’ve ordered a used copy of Chemical Solution Deposition Of Semiconductor Films, as it looks to contain a lot of very practical information. Google Scholar provides links to a large number of published papers that look fascinating, but, for the most part, are also practically unobtainable. Some of the papers are open access, which is really wonderful, but the remainder cost between 20 or 30 dollars apiece, which is pretty steep for a paper that may or may not contain information that is useful to this project. I do need to look into getting a library card at one of the local university libraries. That should provide some access to many of the otherwise overly expensive books and papers, and allow me to more carefully target the books and papers I do purchase in the future. To date, I’ve been able to demonstrate the UV photoconductive sensitivity of a zinc oxide thin (or thick) film, and to demonstrate a change in the conductivity of a zinc tin oxide thin film in response to a voltage applied above the film from an insulated gate. The effect, however, based on a voltage change at the gate of 30 volts, is a changed of 0.07uA on top of a leakage current of about 6.53uA, or about 1 part in 93. Given that the gate insulator is a round #0 slide cover that is approximately 0.1mm thick, which is about 1000 times thicker than a useful gate insulator would be expected to be, I’m actually surprised that I can detect the effect at all. The Heart Nebula (IC 1805) is approximately 6000 light years from earth and appears in the constellation of Cassiopeia. The following image is composed of 60 10-minute Ha-filtered exposures, taken between September 20th and September 26th, 2008. Click on the above image to see the full size original. 2008-09-29 – I decided that the previous image was too dark, so I’ve uploaded a new version that has been stretched a bit more. The Eagle Nebula (M 16) is approximately 7000 light years from earth. 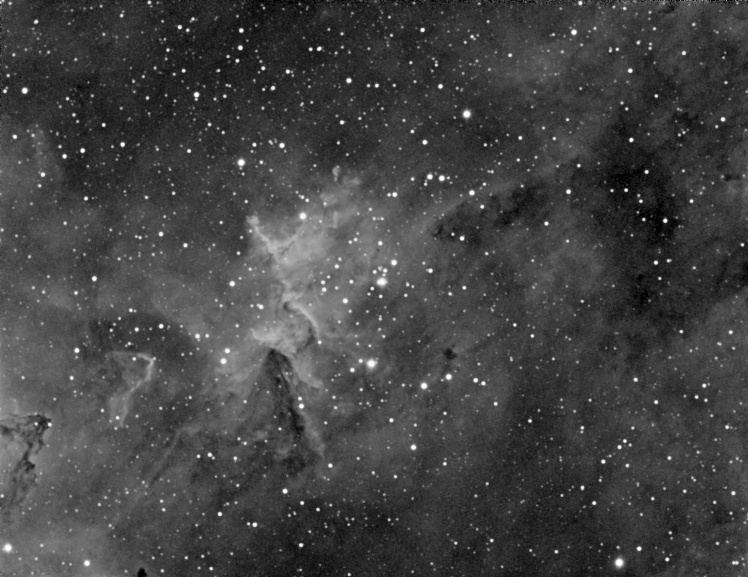 The following image is composed of 69 10-minute Ha-filtered exposures, taken between September 20th and September 26th, 2008. 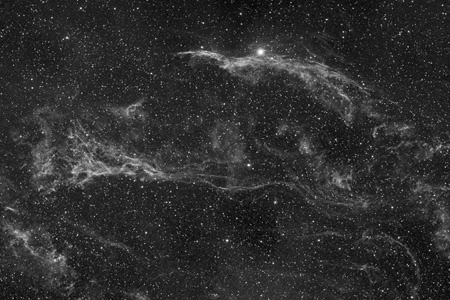 The Veil Nebula (or Cygnus Loop) appears in the constellation of Cygnus and is approximately 1500 light years from earth. It is the result of a supernova that occurred 5000 to 10000 years ago. 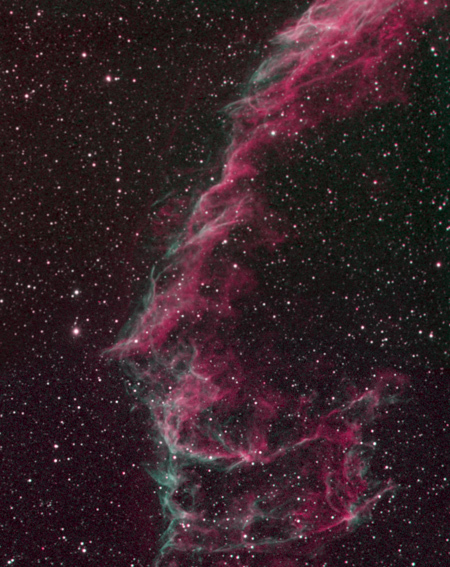 The mosaic below shows only a portion of the entire nebular complex, including the Western Veil Nebula (NGC 6960), also known as the Witch’s Broom Nebula, and Pickering’s Triangle (NGC 6979). Click on the above image for a 50% view of the original. Mosaic of 6×3 Ha filtered images. Each image consists of 22-36 10-minute exposures. Images taken between August 17th and September 19th, 2008. European Space Agency. 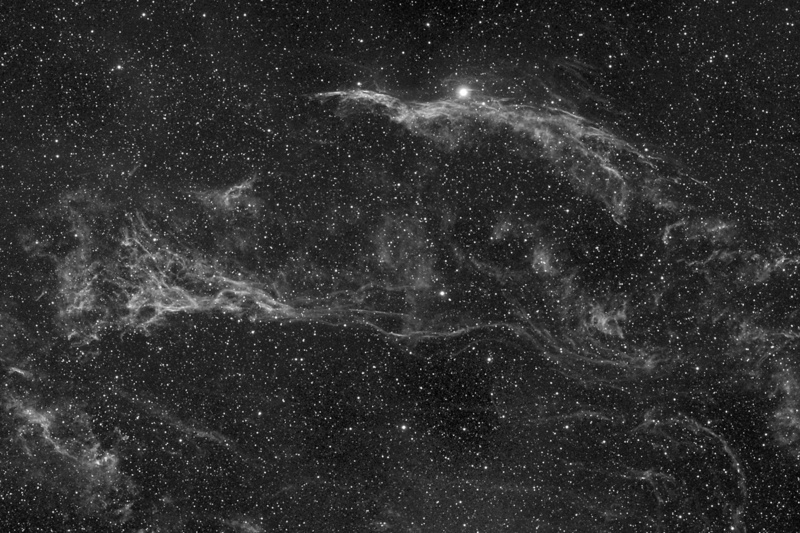 “Uncovering The Veil Nebula.” ScienceDaily 6 August 2007. It turns out that someone hacked this site. It was not something that was normally visible, but rather it was a series of links that would be visible to Google and other search engines, and it was done, no doubt, in an attempt to raise their page rank. That will teach me to remember to upgrade WordPress when new versions come out. Apparently I’m somewhat late in discovering the problem, this was a big issue about 2 months ago. Hopefully I’ve resolved the problem. 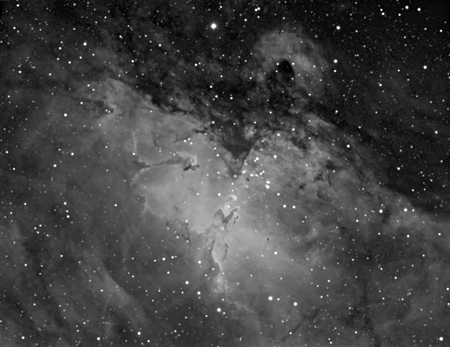 This is a two panel image of a portion of NGC 6995 in Ha and OIII. The color balance is off at bit, and there are some problems with the color layers not quite lining up correctly, but still, it is not a bad image. Exposure: 1 to 3 hours of 10-minute subs per filter per panel. You are currently browsing the And a Quarter Gets You Coffee weblog archives.